The main ingredient of the cosmetic is “vanishing oil” – marula oil. In spite of small capacity (30 ml), straw-coloured oil in a glass bottle holds out very long. If you apply it regularly in small amounts, it delivers maximum moisture, repair and rejuvenation. 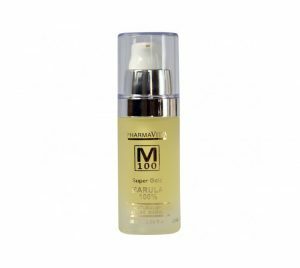 It contains large amounts of vitamin C and E and antioxidants whereas oleic acid provides Pharmavitta M100 Super Gold Marula 100% with an excellent absorption. Some of you may like the spicy fragrance. Marula oil, extracted in the south of Africa, has been used by native inhabitants in body, face and hair care for ages. Therefore, we shouldn’t be surprised that cosmetic companies use it in their cosmetics. There is a difference between adding the oil to a product and launching a product based on a pure marula oil. Pharmavitta has launched such a product. It has proved to be a success. The ingredients are obvious thanks to the name of the cosmetic. 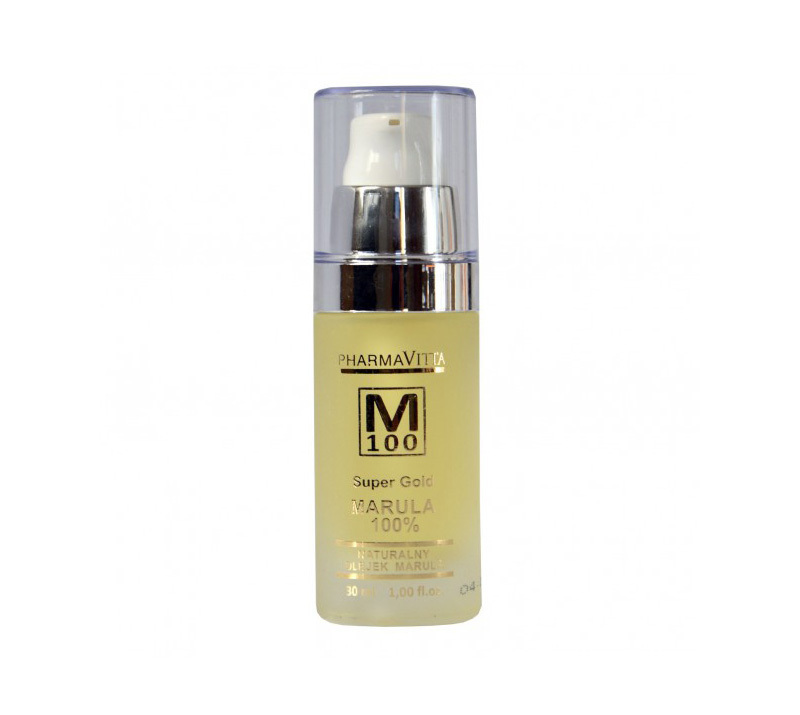 Pharmavitta M100 Super Gold Marula 100% contains one precious oil of superb absorption – natural marula oil. There are no additional substances, preservatives or silicones. Pharmavitta has made sure that M100 Super Gold offers totally natural ingredients. What are the substances included in Pharmavitta oil? Undoubtedly, it is a good thing that Pharmavitta Super Gold Marula 100% has only one ingredient. What is more, this ingredient offers very interesting properties. It saves all hair types. The oil, extracted from marula fruits, has four times more vitamin C than an orange, and lots of vitamin E. it is a rich source of oleic acid and antioxidants, therefore Marula 100% works perfectly in hair care. Pharmavitta M100 Super Gold offers express absorption and consequently – express action. Super Gold Marula 100% can be applied to the skin, even as a make-up primer. What benefits does it bring? Marula oil deeply moisturises, regenerates and improves the resilience. Antioxidant action is also crucial as it slows down hair ageing e.g. hair loss, brittleness, dullness and greying. Pharmavitta marula oil makes hair silky smooth and shiny as well as has a beneficial influence on dry and irritated scalp. The formula of Pharmavitta M100 Super Gold is very interesting. Pure marula oil has a delicate straw colour which is visible thanks to a milk vial. The consistency of the oil is very light, therefore Pharmavitta oil is absorbed very well and doesn’t weigh the hair down. Marula 100% also offers an interesting aroma. The oil smells of spices but the fragrance vanishes quickly. The packaging is good quality but the glass bottle may be troublesome – you may drop it if you have greasy hands. The bottle is elegant and fits perfectly in a hand. The application is trouble-free thanks to a useful pump. In combination with perfect absorption of the oil, the pump increases the efficiency of the product.